Perry Pines - This home needs cosmetic work on the interior and is priced accordingly. MLS#3564972. RE/MAX Professionals. Perry Pines - Amazing outdoor living space with built in grill, patio, low maintenance deck, fence and rock wall with gorgeous flowers. MLS#7164249. RE/MAX Professionals. 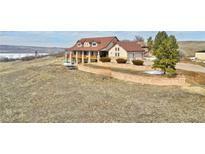 A hidden gem with Colorado mountain living and only about 30 minutes from Castle Rock & DTC. 6 parcels total. MLS#6470038. RE/MAX Professionals. A hidden gem with Colorado mountain living and only about 30 minutes from Castle Rock & DTC. 6 parcels total. MLS#1895461. RE/MAX Professionals. Situated On 242 Breathtaking Acres, This World Class, Fully Gated, Luxury Ranch Offers Endless Opportunities* Exquisitely Appointed Throughout* Just Over 8800 Fin Square Ft Plus Finished Heliport Area, Helipad, Lots Of Outdoor Spaces With Perfectly Manicured Grounds* 4 Ponds* Private Pool, Sauna* Updates Throughout* Heated And Insulated 8 Stall Barn With Caretakers Quarters* Private Canyon* Outdoor Adventures, Hunting* Equestrian , Relaxation,Views For Miles, All This Only 25 Minutes To Light Rail Station Where You Have Easy Access To All Downtown Denver Has To Offer* Only Minutes To Shopping* Close To Downtown Castle Rock* Easy Access To I-25, Dia And Denver MLS#4296683. RE/MAX Professionals.